Getting ready for an all-out sprint? 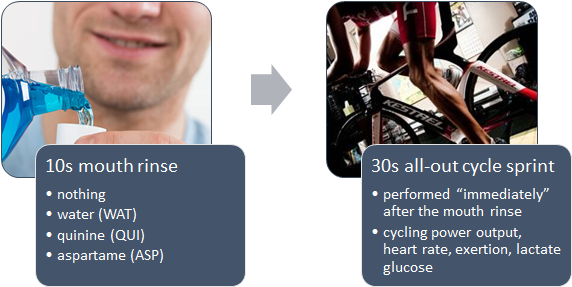 A bitter mouth rinse W/ quinine will provide instant power boost of 4% in ‘ur 30s cycle sprint more than a sweet mouth rinse could do . If you're a powerlifter, the idea that rinsing your mouth with a bitter substance can improve your performance is probably no news for you... even though, powerlifters smell, not taste ammonia, smelling and tasting are, after all, more or less two sides of the same coin (Rozin. 1982). Against that background and in view of the similar brain activation patterns scientists have observed in response to bitter and sweet taste perception, it appears only logical for Sharon Gam et al. to speculate in a 2014 paper, which is still worth its own SuppVersity article (! ), that rinsing w/ quinine, a distinctly bitter substance, could produce the same or at least similar power increments as sweet substances. Of the latter, previous research has shown that they will elevate both peak power (+22.1 ± 19.5 W; ES, 0.81; p = 0.0667) and mean power (+39.1 ± 26.9 W; ES, 1.08; p = 0.0205 | Beaven, et al. 2013), during all out sprints. The goal of the researchers from the University of Western Australia was thus to elucidate, "whether combining mouth rinsing with the ingestion of a bitter-tasting solution composed of quinine acutely improves mean and peak power during a 30-s maximal cycling sprint effort" (Gam. 2016) would yield similar benefits. To be able to tell how similar sweet and bitter taste effects on sprinting performance actually are, they scientists compared the effects of 0.36 mL/kg body mass of a 2-mM quinine HCl solution (QUI; Sigma-Aldrich), not just to plain water and a no rinse control (CON), but also to a 0.05% w/v aspartame solution (ASP; Sigma-Aldrich), all of which were used immediately before the 30s all-out sprint on an Exertech EX-10 front access cycle ergometer. Figure 1: My graphical "illustration" of the study design (based on facts from Gam. 2014). As the authors explain, the "volume of 0.36 mL/kg was chosen to account for differences in body size, with each participant receiving approximately 25–35 mL of solution per session" (Gam. 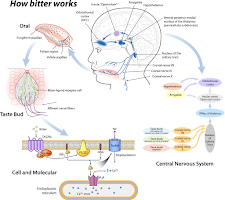 2014) and the "[p]articipants were instructed to rinse their mouth for 10 s and then ingest the solution", a practice that was prescribed to ensure "that bitter receptors at the back of the tongue were activated because there is evidence that the strongest sensation of bitterness occurs in that area of the oral cavity" (Gam. 2014). Have you ever asked yourself how "bitter works"? Here is the answer from a 2013 paper by Mennella, et al. 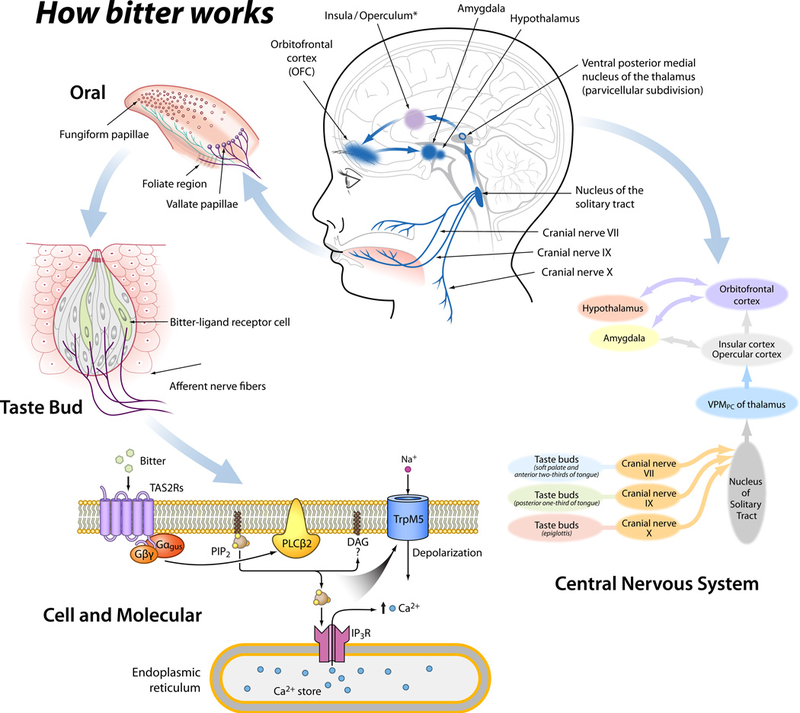 → "The generation of bitter taste starts when a bitter compound enters the oral cavity, where the ligand binds to a T2R G-protein coupled receptor expressed in the apical membrane of receptor cells found in taste buds, triggering a cascade of signaling events, leading to the release of neurotransmitter that activates an afferent nerve fiber that transmits the signal via the cranial nerve to the brain. Taste buds are distributed in distinct fields in the oral, pharyngeal, and laryngeal epithelia, with each field innervated by a different cranial nerve branch. Only the taste buds on the tongue are depicted in the figure." As you can see in the selected performance markers I've plotted for you in Figure 2, the fourteen competitive male cyclists, who performed a 30-s maximal cycling sprint immediately after rinsing their mouth for 10 s and then ingesting the aforementioned solutions (QUI, water, ASP, CON), experienced significant increases in both mean power output by 2.4%–3.9% [P < 0.021, effect size (ES) = 0.81–0.85] and peak power output in the quinine condition. Figure 2: Relative changes in mean & peak power (%) + effects sizes for quinine vs. CON, WAT or ASP (Gam. 2014). For the latter, it is yet important to point out that a significant performance enhancement in terms of the peak power output was recorded only in comparison to the water (3.7%, P = 0.013, ES = 0.71) and the control (3.5% P = 0.021, ES = 0.84) conditions, yet not compared to the aspartame condition (1.9%, P = 0.114, ES = 0.47), in which the scientists observed a non-significant increase in performance compared to the water and control trial. Differences in heart rate, perceived exertion, or blood variables between any of the conditions were not observed. Bitter taste increases ghrelin, ghrelin rapidly increases noradrenaline and adrenaline - if that's what explains the effects of quinine will yet have to be elucided in future studies. So what's the mechanism, here? Unfortunately, the researchers don't speculate about the mechanism behind this, for sprinters and power athletes highly relevant effect of quinine (or other bitter tastants). 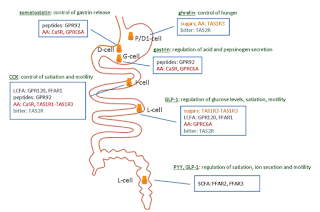 My brief research of the existing research on bitter taste receptors, however, suggests various possible mechanisms with the release of ghrelin in response to bitter taste sensing (Janssen. 2011) and its effects on gluconeogenesis, noradrenaline and adrenaline (Enomoto. 2003 | see Figure on the right) being a candidate that would usually have us expect to see more pronounced increases in heart rate than they were observed in the study at hand, where quinine raised the heart rate only in the absence of exercise (by ~3-4 bpm). 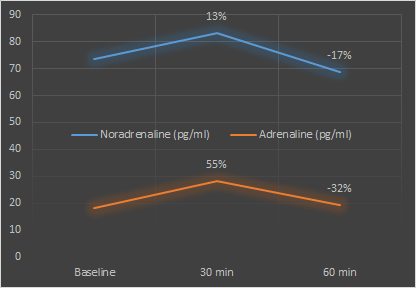 It is thus questionable, whether the ghrelin => (nor-)adrenaline hypothesis provides the correct explanation - not just, but also because previous research suggests that the benefits of rinsing your mouth with bitter substances before sprinting may have the same origin as those that occur in response to carbohydrate mouth-rinsing, the triggers of which are likewise believed to "reside in the central nervous system" (Jeukendrup. 2010) and thus to be of non-metabolic origin. Since the quinine solution was also swallowed, effects that were triggered by bitter taste receptors (ghrelin remains the most likely candidate) in endocrine cells along the gut (figure from Depoortere. 2014) could also explain the performance increases. Speaking of carbohydrate / sweet mouth rinses, it should be mentioned that the lack of significant performance differences (1.9%, P = 0.114, ES = 0.47) between the aspartame and the quinine trial in the study at hand appears to suggest that sweet and bitter mouth rinses work by the same, still to be elucidated mechanism (it should be said, though that structural analogues of aspartame have been found to active the bitter taste receptor, as well | Benedetti. 1995). In view of the fact that this hypothesis is, as Gam et al. point out, in line with the results of "studies based on functional magnetic resonance imaging [, which] have shown that the brain areas activated in response to the bitter tastant, quinine, overlap to a great extent" with those brain areas that are stimulated when you rinse with CHOs / sweet solutions (Zald. 2002; Small. 2003), finding mechanistic explanations for one of these performance enhancer (e.g. the sweet mouthrinse) may also yield explanations for the performance enhancing effects of the other one. Whether that's the actual reason for the preformance increases does yet appear questionable. After all, a 2015 follow up study by the same researchers showed that that mouth rinsing with the same bitter quinine solution without ingesting it won't improve young athletes' sprint cycling performance (Gam. 2015) - in view of the presence of ghrelin producing cells in the digestive tract (see Figure in this bottom line), this does not falsify the "ghrelin" => (nor-)adrenaline hypothesis, which would also be in line with the increases in corticomotor excitability Gam et al. observed in yet another follow up study in male competitive cyclists (Gam. 2015b), in which the quinine was ingested, too | Comment! Beaven, C. Martyn, et al. "Effects of caffeine and carbohydrate mouth rinses on repeated sprint performance." Applied Physiology, Nutrition, and Metabolism 38.6 (2013): 633-637. Benedetti, Ettore, et al. "Sweet and bitter taste: Structure and conformations of two aspartame dipeptide analogues." Journal of Peptide Science 1.6 (1995): 349-359. Depoortere, Inge. 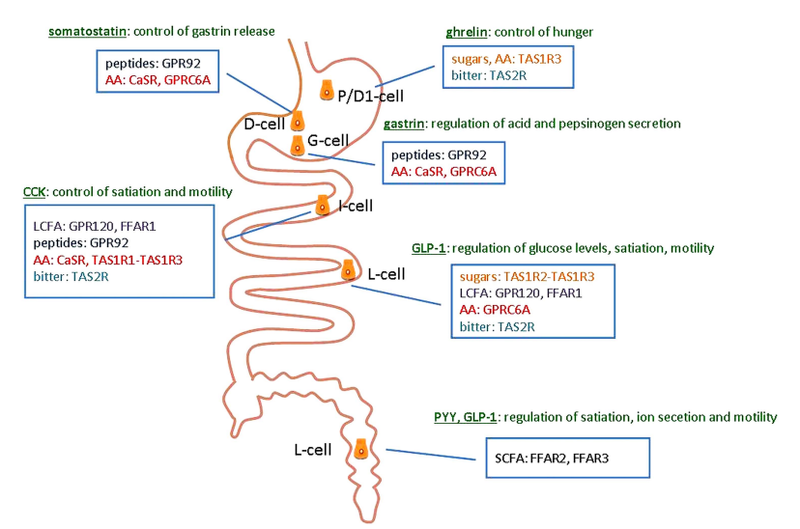 "Taste receptors of the gut: emerging roles in health and disease." Gut 63.1 (2014): 179-190. Enomoto, Mitsunobu, et al. "Cardiovascular and hormonal effects of subcutaneous administration of ghrelin, a novel growth hormone-releasing peptide, in healthy humans." Clinical Science 105.4 (2003): 431-435. Gam, Sharon, Kym J. Guelfi, and Paul A. Fournier. "Mouth rinsing and ingesting a bitter solution improves sprint cycling performance." Medicine and science in sports and exercise 46.8 (2014): 1648-1657. Gam, Sharon, et al. "Mouth rinsing with a bitter solution without ingestion does not improve sprint cycling performance." European journal of applied physiology 115.1 (2015a): 129-138. Gam, Sharon, et al. 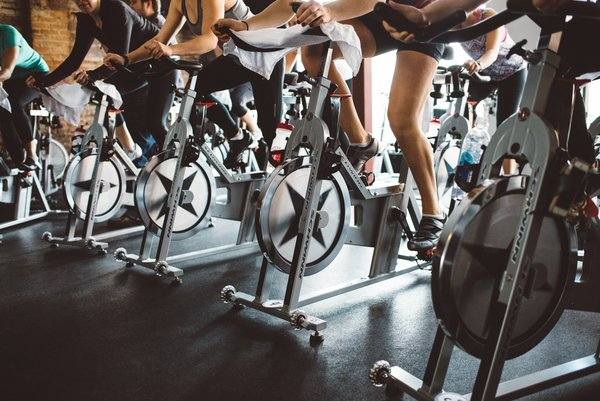 "Mouth rinsing and ingestion of a bitter-tasting solution increases corticomotor excitability in male competitive cyclists." European journal of applied physiology 115.10 (2015b): 2199-2204. Janssen, Sara, et al. "Bitter taste receptors and α-gustducin regulate the secretion of ghrelin with functional effects on food intake and gastric emptying." Proceedings of the National Academy of Sciences 108.5 (2011): 2094-2099. Jeukendrup, Asker E., and Edward S. Chambers. "Oral carbohydrate sensing and exercise performance." Current Opinion in Clinical Nutrition & Metabolic Care 13.4 (2010): 447-451. Rozin, Paul. "“Taste-smell confusions” and the duality of the olfactory sense." Attention, Perception, & Psychophysics 31.4 (1982): 397-401. Small, Dana M., et al. "Dissociation of neural representation of intensity and affective valuation in human gustation." Neuron 39.4 (2003): 701-711. Zald, David H., Mathew C. Hagen, and José V. Pardo. "Neural correlates of tasting concentrated quinine and sugar solutions." Journal of Neurophysiology 87.2 (2002): 1068-1075.